As I reached the boardwalk, I glanced to my right and realized that I was eye-to-eye with a snake that was loosely coiled on top of a bush. 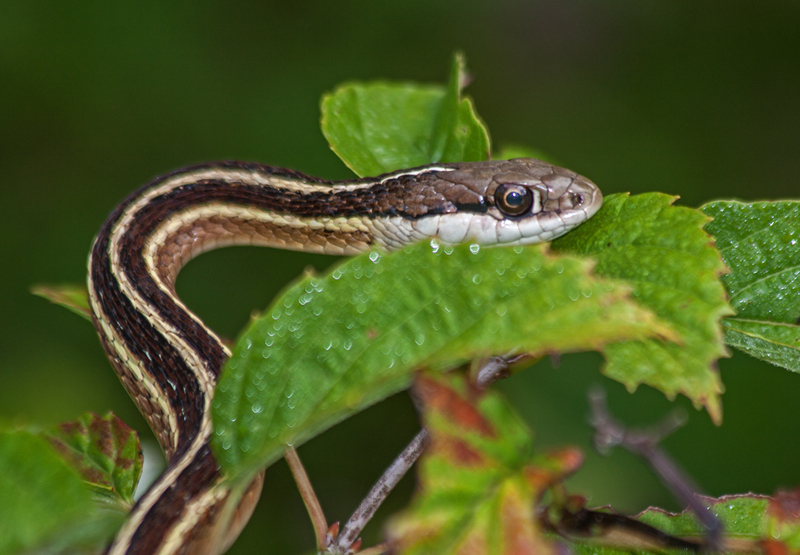 This Common Ribbonsnake (Thamnophis sauritus sauritus) seemed to have appointed himself as the official greeter of the day at the marsh, though I suspect that not all visitors welcomed his presence so close to them as they walked by. Do you photograph some subjects over and over again, hoping to get better (or at least different) images? I never grow tired of observing herons and egrets at my local marshland park. Most of the time, they (and I) are standing still, waiting for a brief moment of action, generally when they are fishing or when they take off into the air. These birds look gangly and awkward when on the ground or in the water, but when they are flying, it’s like watching an aerial ballet. I took this shot last Friday as a Great Egret (Ardea alba) was just taking off from the muddy waters of one of the small ponds at the park. 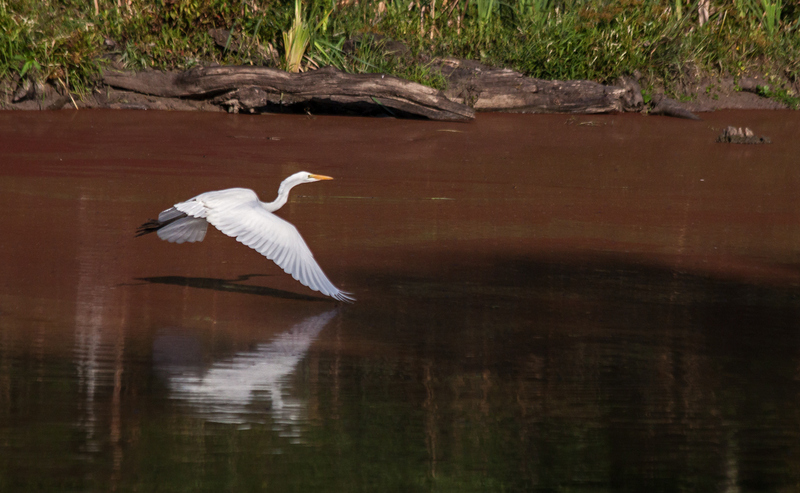 I was thrilled to be able to capture both a shadow and reflection of the graceful bird. Although I often have trouble getting a good exposure and frequently blow out the highlights, in this case I as able to capture some of the details of the wing feathers. The egrets will be migrating out of this area soon, but I will continue to have the herons to keep me occupied in the upcoming months (and I’ll be trying to get more shots like this one). 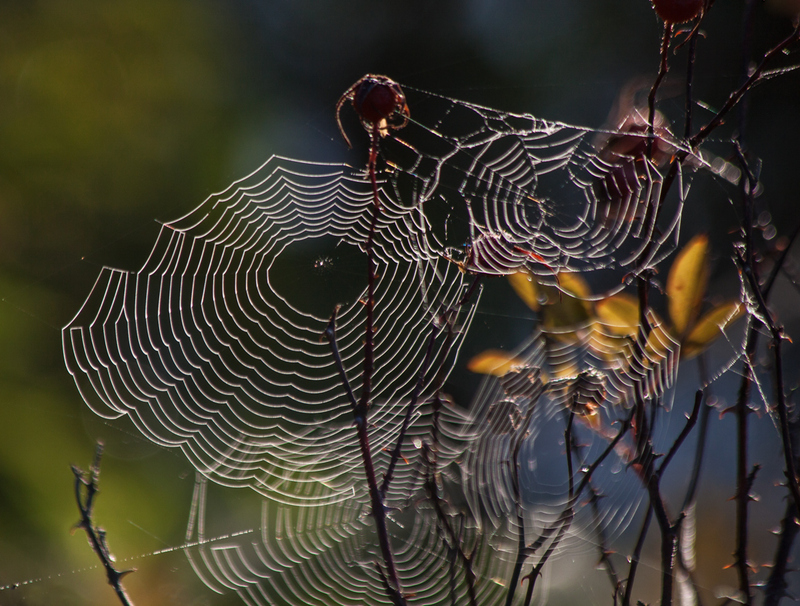 When the urge to take some photos strikes me and I don’t want to travel very far, I can usually depend on Cindy Dyer, my neighbor and photography mentor, to have something interesting to shot in her garden. 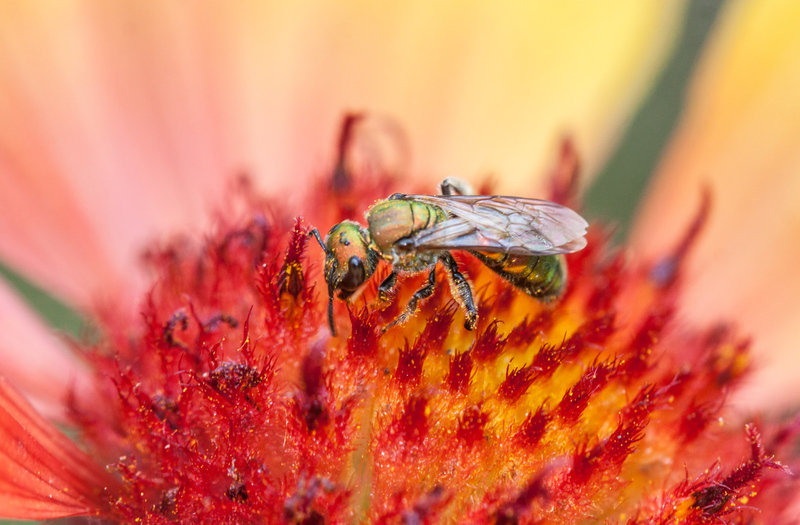 About five o’clock today, I photographed what looks to be a tiny metallic green bee on one of the colorful flowers still in bloom at the side of her townhouse. I like my fall colors to be bright and vivid, not muted and faded. 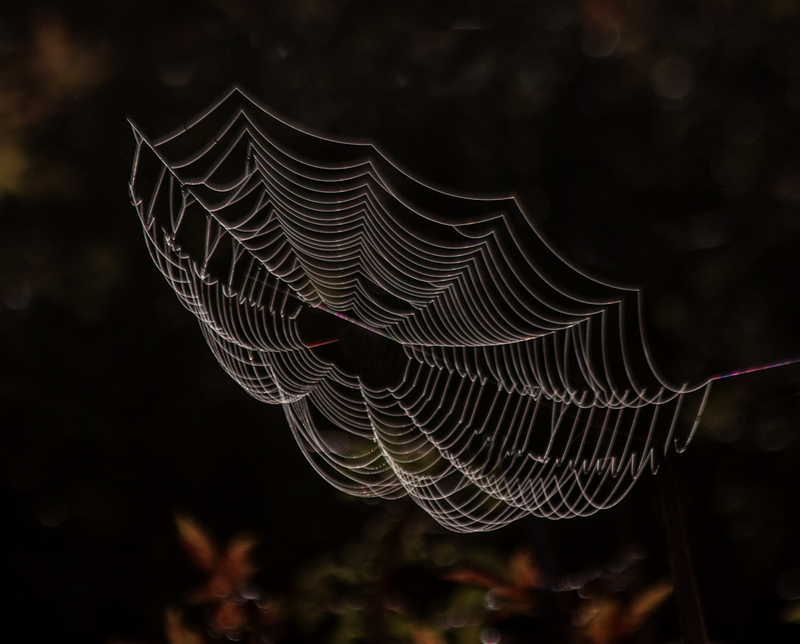 One of the joys of arriving early at the marsh at this time of the year is having the chance to see spiders’ handiwork, backlit by the rising sun. It won’t be long before most of the dragonflies are gone for the season, so I am really enjoying them while they are still around. 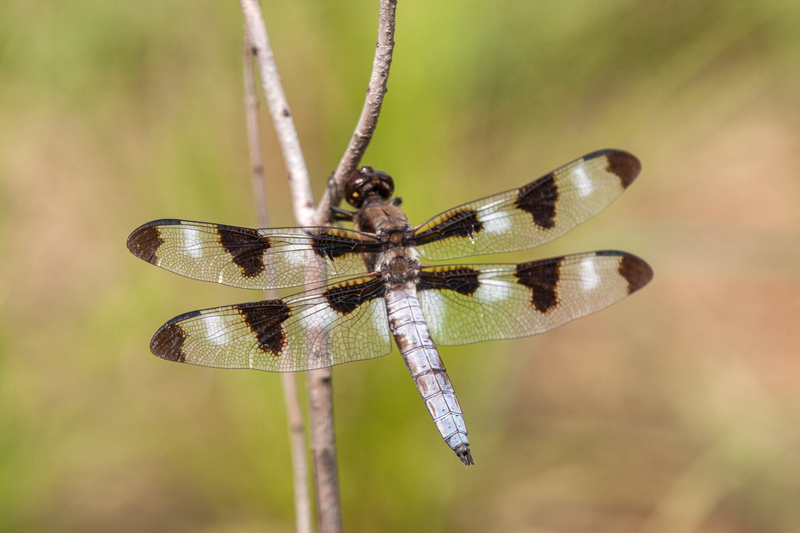 A little over a week ago, I was able to capture images of some male Twelve-spotted Skimmer dragonflies (Libellula pulchella), a species that I had not seen previously this summer. 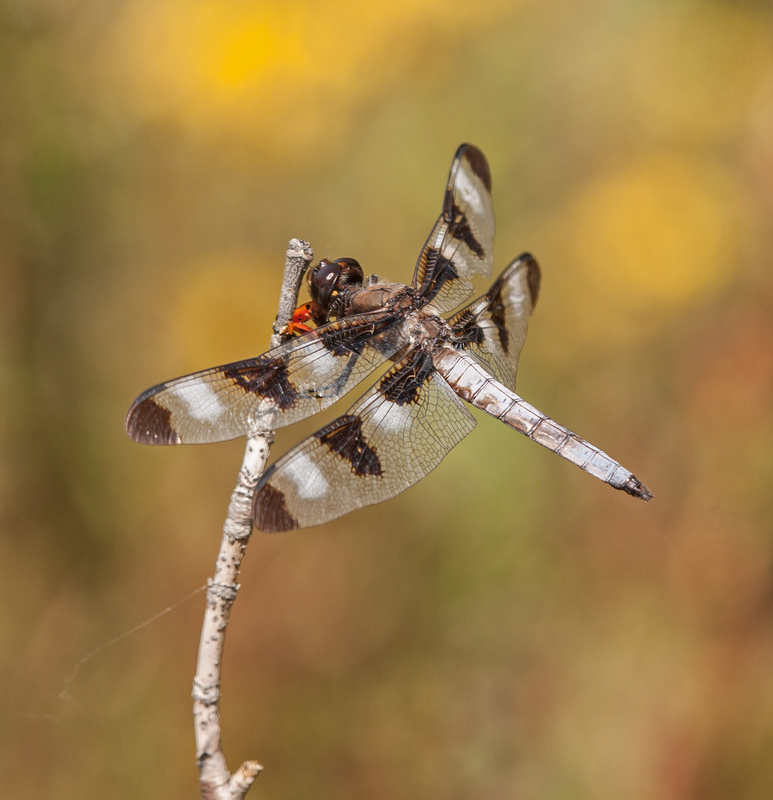 In the first shot, the dragonfly seems to be eating something that is bright red in color. I can’t tell for sure, but when I zoom in, it looks like it might be a ladybug. Whatever the case, I am happy that I was able to frame the shot to be able to get some of the yellow meadow flowers into the background. In the other shots, I worked to get the wings into focus by shooting on a plane horizontal to their position. 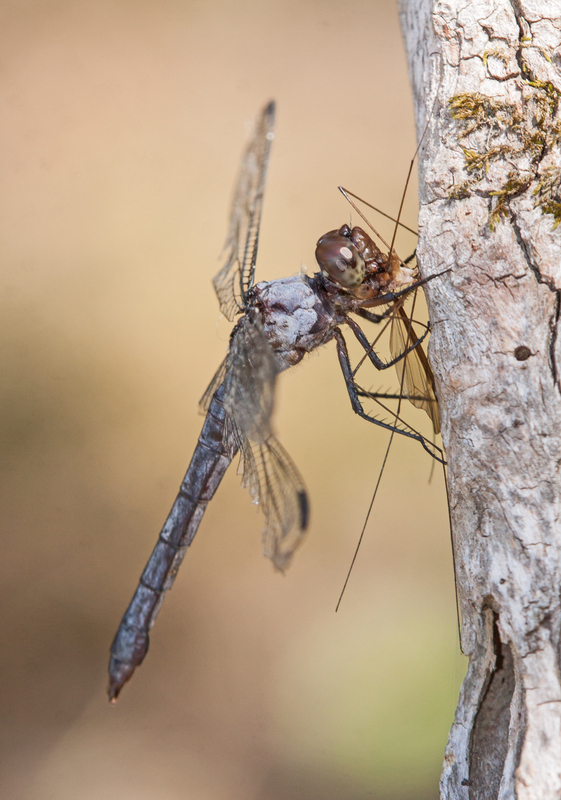 The dragonflies were reasonably cooperative and I am pretty happy with the resulting images. 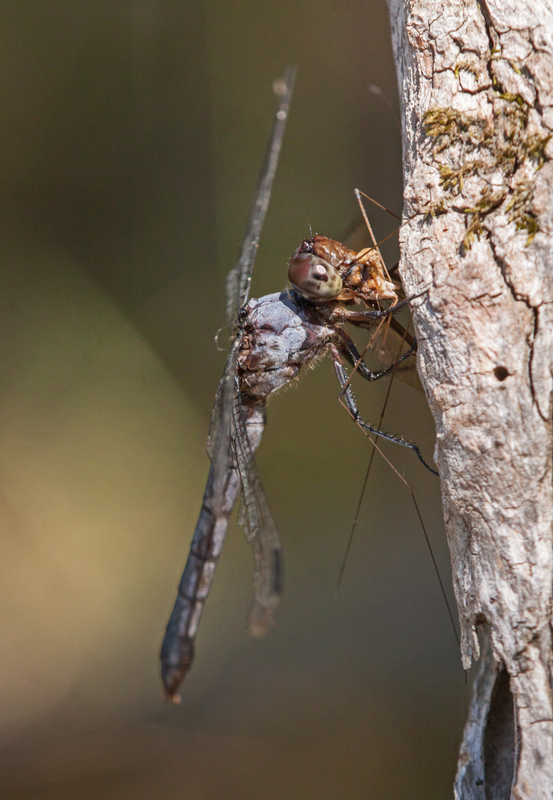 What do dragonflies eat for lunch? 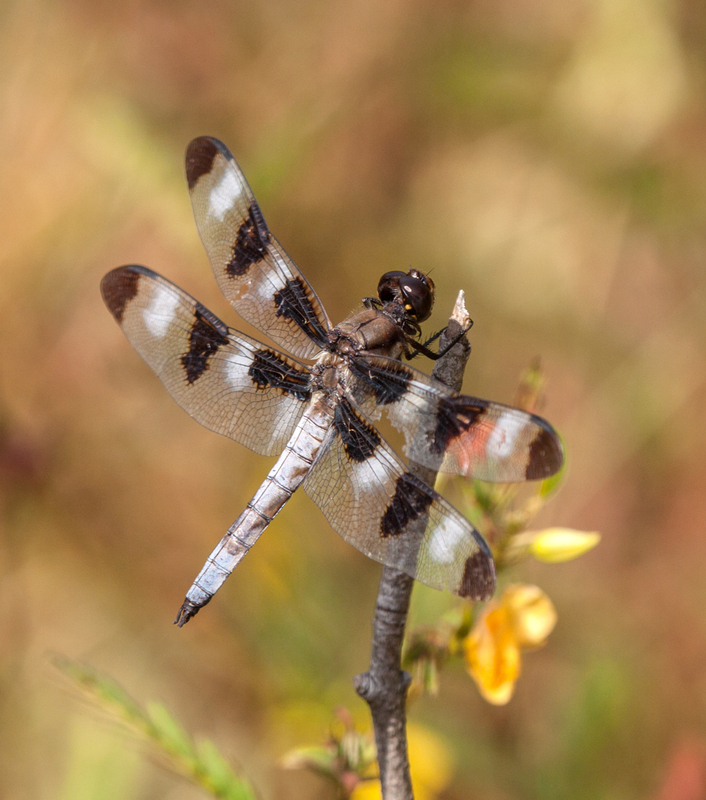 I stumbled upon this dragonfly earlier in September as it was beginning to enjoy a freshly caught insect. 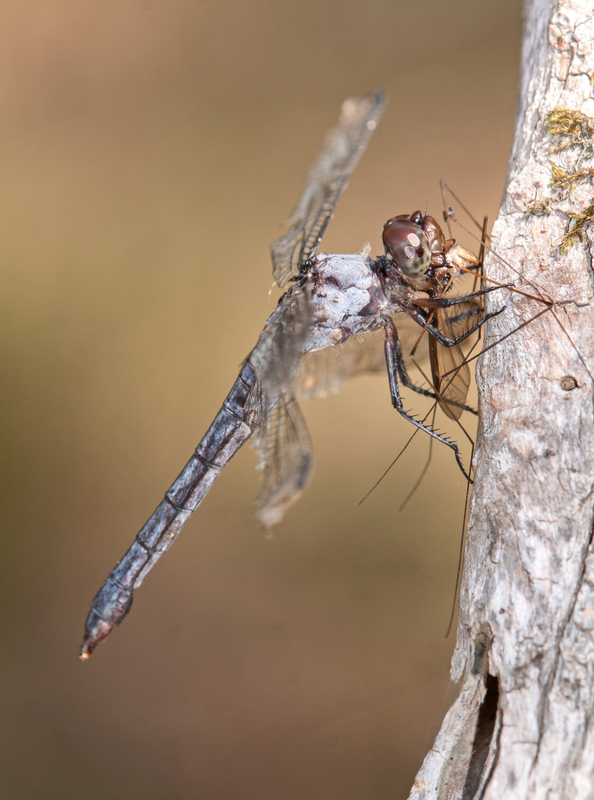 Judging from the long legs and wings of the prey, it looks like the dragonfly is munching on a crane fly. The dragonfly was so focused on eating that it let me get pretty close without flying away and I was able to take a number of shots from different angles and with different settings. 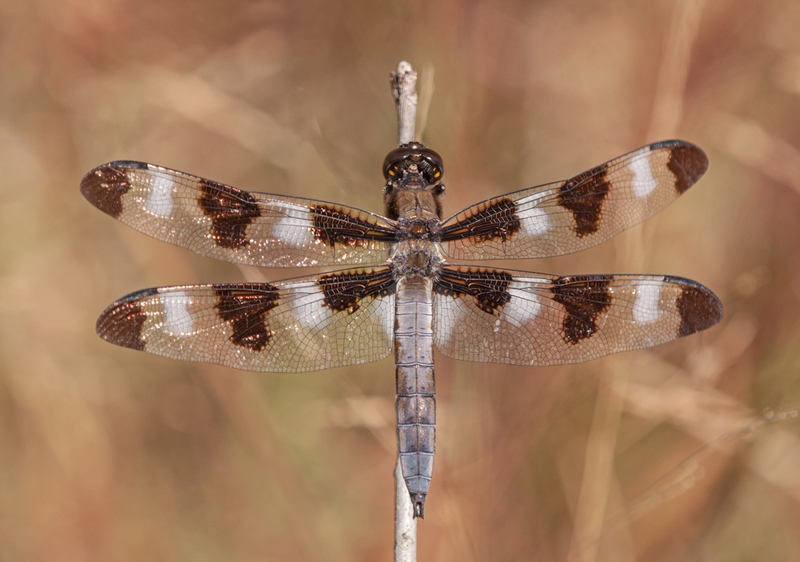 I defer to others on identification of the dragonfly species. I initially thought it was a Great Blue Skimmer, but the eye color seems wrong. It’s autumn now and my thoughts (and my camera) are starting to focus more on birds than insects. 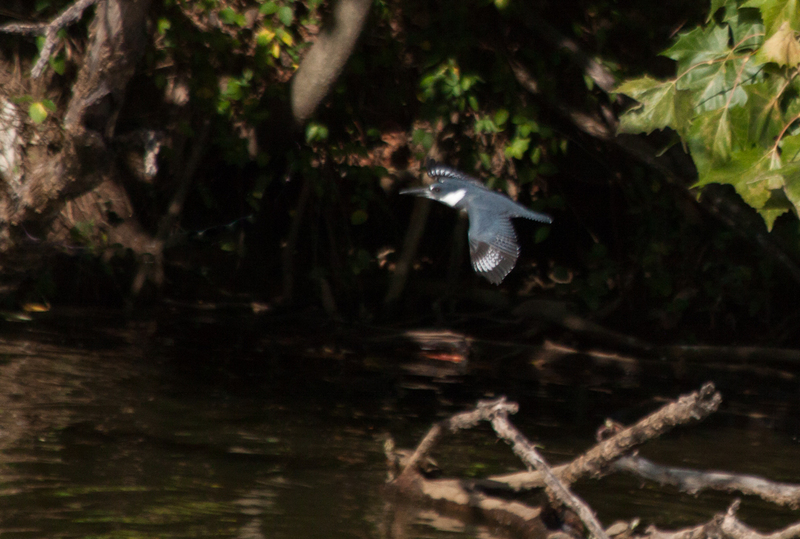 This past weekend, I returned to a location where I had previous seen a female Belted Kingfisher (Megaceryle alcyon). The kingfisher would perch on the limbs of some trees overlooking a small trout-stocked pond called Lake Cook, which is really more like a small pond, and periodically make a foray across the surface of the water and grab a fish. I realized this time that I had a problem—there are so many leaves still on the trees that I couldn’t spot the kingfisher when I heard its very distinctive, rattling call. 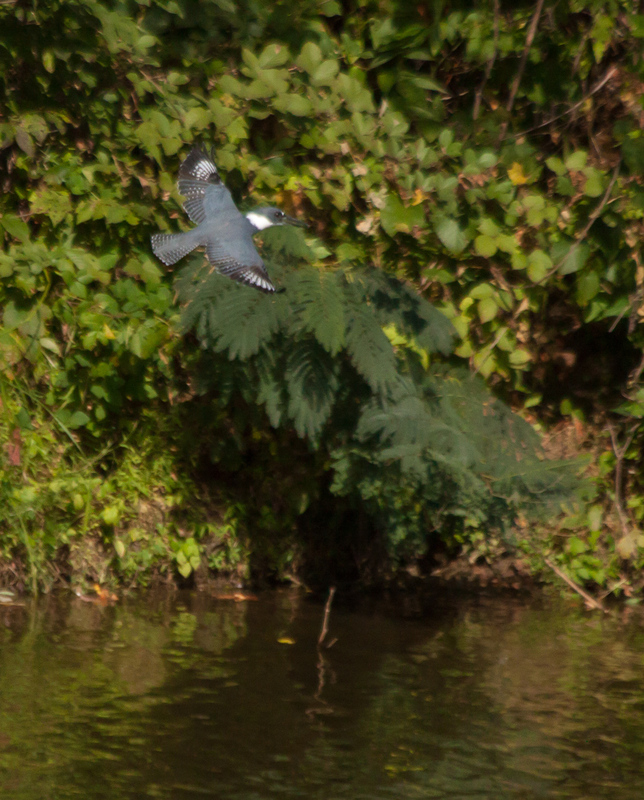 I could get a general idea of its location, but couldn’t see the kingfisher until it was already in flight, which mean I had to react really quickly to acquire and track it, hoping that I would be able to focus on it. 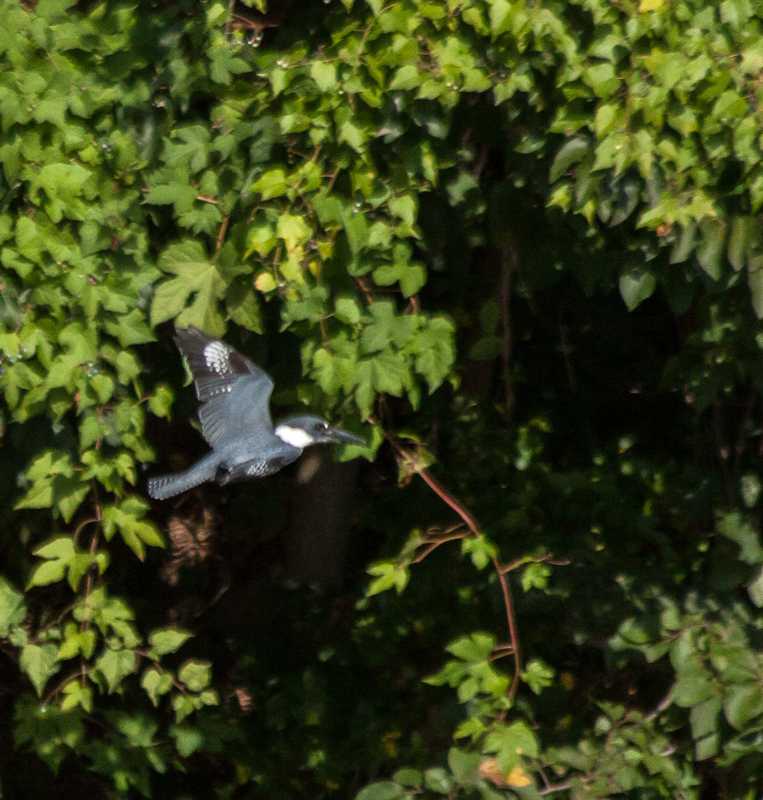 As it turns out, hope is not really an effective photographic technique and not surprisingly I ended up with a lot of blurry, improperly exposed images, in part because the kingfisher was flying in an out of the shadows. 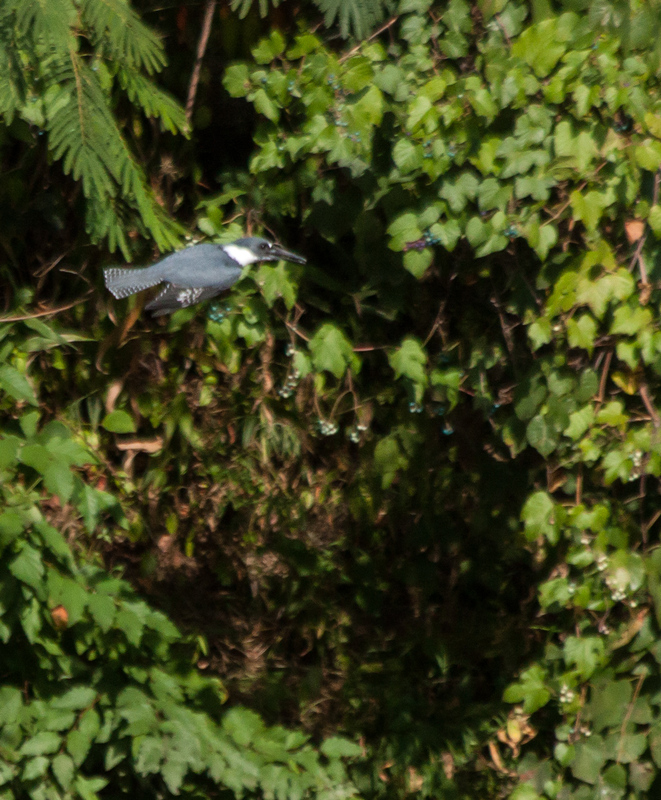 I was pleased, though, that I was able to capture a few decent images of the kingfisher in flight. I was shooting from across the pond from where the kingfisher was perched, so the shots are not close-ups of the bird, but are more like environmental action shots. Maybe I need a longer lens!